AU is one of the weakest and ineffective continental blocks ever.Its budget is supplemented by EU and always looks to the West to take lead. The retired French general Vincent Desportes told the BBC World Service last week that France should back political change in Mali and remain in the country as long as necessary. In the Central African Republic (CAR), the current deployment of 1,600 French troops is insufficient: at least 5,000 are needed, Desportes said. No one batted an eyelid. Yet a decade ago, such statements would have been denounced as outrageous imperialist ambition to re-colonise Africa. So what has changed? 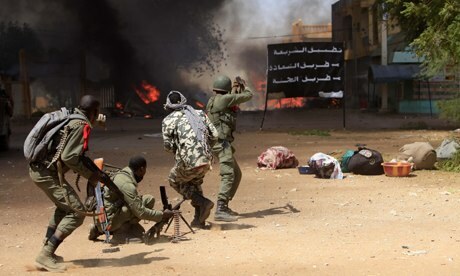 From Mali to Somalia, the continent has been convulsed by an arc of conflict. Consider the most recent wars, in CAR and South Sudan. Médecins Sans Frontières, the normally unflappable aid agency, described the violence in CAR as out of control. Half the citizens of Bangui have fled the town and, across the country, about 785,000 people are displaced. 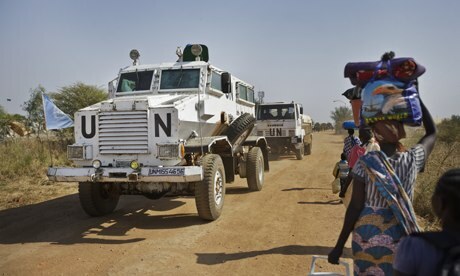 The situation in South Sudan is little better: the UN says more than 194,000 people have fled their homes and that 107,000 seek shelter around UN bases. In all this bloodshed the African Union (AU) is nowhere to be seen. 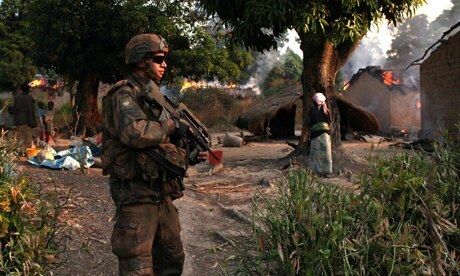 It was French troops that were airlifted into CAR to save the day – just as they did in Mali, Niger and Ivory Coast. UN peacekeepers are being rushed from Darfur, Liberia, Ivory Coast, and even Haiti, to try to staunch the fighting in South Sudan. The US deployed marines from their base in Djibouti to Uganda and Juba, the South Sudanese capital, to assist in the evacuation of Americans. The much-vaunted African Standby Force, with its regional Standby Brigades at the beck and call of the AU has failed to materialise. The idea of a military force answerable to African leaders has its origins in the Rwandan genocide of 1994. Horrified as they looked on helplessly, this bred a determination to intervene in future conflicts. The problem was discussed in Harare, Zimbabwe, in 1997 by African chiefs of defence staff, but the initiative had to wait until July 2002 before it receive a formal go-ahead. African leaders planned to have five regional forces by 2010 to bring security to their troubled continent. The Standby Brigades would answer to the AU’s peace and security council, the continental equivalent of the UN security council. The aim was to produce a rapidly deployable force and that by 2012 two units, each 2,500 strong, could be operational within just 14 days. The Standby Brigades gave teeth to this intention and won considerable western support. The US poured money into the initiative, providing $500m to train up to 50,000 African troops. British involvement was also substantial, with more than £110m a year being invested via the African Conflict Prevention Pool for nearly a decade. Today the figure stands at £51.5m. The pool is a joint initiative, run by the Foreign Office, the Ministry of Defence and the Department for International Development. Little hard information has been provided about its programmes, which were criticised by an independent review. In reality the Standby Brigades have not got off the ground. Differences between African states run far too deep for them to be used in the continent’s many crises. Many of the troops are insufficiently trained, armed or disciplined to be deployed effectively. In November 2013 an official statement from the South African government took the route of least resistance: it announced that the force would be renamed. The “African Capacity for Immediate Response to Crises” would be what was termed a “transitional arrangement” until the African Standby Force was up and running. The Nigerian Guardian was more forthright. It reported that the Standby Brigades had made little progress since they were dreamed up more than a decade ago. Some member countries of African Union, (red) have not recognised South Sudan yet. Africa today is full of despots and power hungry village headsmen masquerading as National Leaders.Africa lacks standout leaders with loud voices to stop a conflict before guns have been fired. So why the failure? It is not as if Africa is incapable of running military operations, given sufficient outside financial and logistical support. The 25,000 strong AU Mission to Somalia, or Amisom, has driven al-Shabaab, the al-Qaida affiliate, out of the capital. Amisom holds substantial areas of Somalia, but it is, in reality, run by its troop contributors. So Uganda and Burundi call the shots in the capital, while Ethiopia runs its operations in the west, and Kenya holds a strip of land in the far south. Although it nominally works in the AU, the organisation has little control over what it can and cannot do. Africa will never have the like of Mandela again.He only served one term in office. The root of the problem lies with a failure of African leadership. When Nigeria’s Olusegun Obasanjo and Thabo Mbeki of South Africa held office they worked hand in glove on a range of issues. For a time it seemed that the concept of an African renaissance might become a reality. But the moment faded. Today Nigeria is resentful that South Africa is the continent’s representative among the Brics group of emerging economies. Both countries vie for a possible African seat on the UN security council. And, in Goodluck Jonathan and Jacob Zuma, both nations are saddled with weak presidents obsessed with domestic problems and incapable of giving a sense of direction to the continent. Africa today has 18 countries with leaders who have been in office for 10 -35 years. In total they boast of over 300 years of political experience.Yet AU is host to nearly 20 nations at armed conflict one way or the other. What purpose does longevity in office and experience play if they cannot avert bloodbath on the continent. What is clear is that all of them have amassed great wealth while in office as leaders because apparently, their countries belong to them.African nationals are denied some basic rights and liberties like freedom of expression, health and education. It is also comforting to note that the grandees can afford top class education in the west for their children and state of the art healthcare system abroad whenever they sneeze. As a result, the African Standby Force has gone the way of so many other initiatives. Who, for example, now talks of the African Peer Review Mechanism, or suggests there can only be “African solutions to African problems?” From Bamako to Bangui, ordinary African men and women have cowered and waited, hoping that western troops or UN peacekeepers will come to their aid. Why is France sending troops to Africa again? Posted on 6th January 2014 by newsafrica. This entry was posted in Africa, African Security, Barack Obama, Breaking News, Central African Republic, Culture, Democracy, Human Development, Mandela, President Jonathan, South Africa, South Sudan, Sudan (North). Bookmark the permalink.